The TM Alliance consortium was formed under the auspices of the Information Society Technologies (IST) Directorate of the EC. It is a partnership between three prominent organizations, ESA, the WHO (World Health Organisation, European Office for Integrated Health Care Services, Barcelona), and ITU (International Telecommunication Union, Telecommunication Development Bureau, Geneva). This partnership, coordinated by ESA, ESTEC, Human Space Flight, Microgravity and Exploration Directorate, is now in its second phase of work, known as TMA Bridge. The first phase of this project saw the formulation of an overlying policy for the application of telemedicine in support of, primarily, the European citizen by the year 2010. The strategic goal is the improvement of public health and quality of life, adapting to changing needs and utilizing existing and new technological capabilities, while at the same time increasing the efficiency and cost-effectiveness of these services. The TM Alliance’s Vision is therefore one of citizen-centred healthcare; the system should be built around the citizen rather than bending the citizen to fit into the system. In this vision, the citizen is the client who should be in a position to demand good services rather than the supplicant who is grateful for whatever services are thrown his way. The road towards citizen-centred healthcare must be clearly drawn, built on a solid foundation, and paved with concrete goals, as underlined in this Vision. The road to realization of a vision is strewn with impediments and roadblocks. Before this Vision can be realized the road must also first be paved, and the roadblocks and barriers cleared. The results of the first phase pointed to the critical importance of first establishing a solid basis of standards and interoperability, before progress and necessary investment can be made. The lack of technical standards and medical coding systems was identified as being a major show-stopper for progress towards Telemedicine and eHealth implementation. 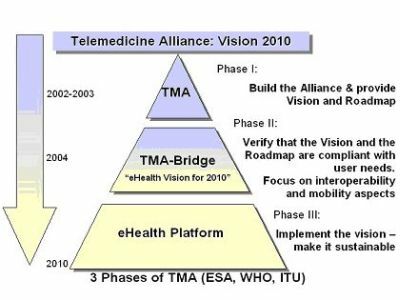 The second phase of the TMA thus focuses on building the bridge between the Vision and its realization, and is aimed at promoting the creation of a European eHealth Area, favouring the mobility aspects in the European Union. To do so the project will tackle the barriers to the achievement of a real mobility space for EU citizens, and facilitate citizen-centred healthcare services. Emphasis is on all echelons of interoperability required for the cooperation of different health systems, such as technical, organisational, social and political.